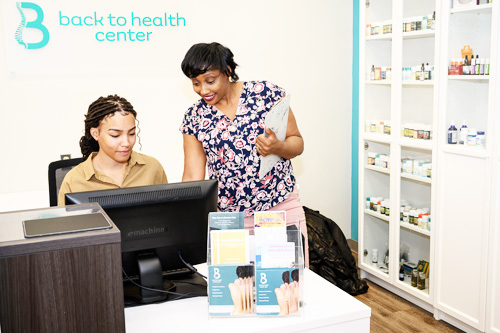 You may have questions about what the Back to Health Center team does and what we can offer you. We’ve created a list of the most common concerns voiced by our patients to give you the answers you need. Do you have questions that aren’t answered here? Reach out to our team! What types of services and techniques do you offer? At Back to Health Center, a range of natural solutions are available that are suitable for children, adults and senior citizens. Chiropractic care, acupuncture, massage therapy and cold laser therapy can help you heal and live free from pain. Chiropractic care helps you reach optimal health by having an aligned spine and body. As chiropractors, Dr. Shara and Dr. Shawnté diagnose and correct spinal subluxations or misaligned vertebrae. The spine encloses your spinal cord, and these out-of-place vertebrae can compress disc and nerves, causing pain and dysfunction. We use gentle, precise corrections to realign your vertebrae after a thorough examination that identifies any areas of concern. Subluxations, or misalignments of the vertebrae, can happen in various ways. You might have a subluxation from sitting at a desk all day, sleeping on the wrong mattress or a sudden trauma such as a slip and fall or car accident. When your vertebra goes out of alignment, you can see issues develop such as headaches, back pain, sciatica, fatigue, allergies, carpal tunnel syndrome, temporomandibular joint (TMJ) disorders and much, much more. An adjustment is performed to promote your body’s proper function. Adjustments are given only after a thorough examination. Gentle pressure is applied with the hands or an adjusting instrument to put your vertebrae back into alignment. Will it hurt to get adjusted? In short, no. Our patients find that their pain is relieved after the adjustment. What conditions might chiropractic care help? Many musculoskeletal injuries are appropriate for chiropractic, from back pain to arthritis to fibromyalgia and headaches. We also treat repetitive motion and sports injuries such as carpal tunnel syndrome, herniated discs, tennis elbow and runner’s knee. Chiropractic care is also appropriate in helping you maintain your wellness after you recover. Which massage types do your massage therapists offer? Does chiropractic care safely treat back pain? Yes! Our techniques are completely natural and encourage your body to heal by having optimal nervous system function. It’s safe for expecting moms, senior citizens, babies and other people who can’t or don’t want to take medications or resort to surgery. What qualifications do your chiropractors have? Dr. Shara and Dr. Shawnté hold Doctor of Chiropractic degrees in addition to their undergraduate qualifications. They’ve studied for hundreds of hours, more than most medical doctors, in subjects such as anatomy, neurology, orthopedics and physiology and are extremely competent in diagnosing and alleviating many common health problems. Are you wondering what we can do for you? Contact us today to get started! Insurance coverage can be used for your visits.